Thanks for the question. They are actually annuals, which I grow very few of here in my own garden. The left hand one is perilla, which many people are reluctant to plant because it goes to seed and literally makes thousands of plants the next spring. If you pull off the seed heads you'll do a bit better. The other two are coleus cultivars. Hi. That is an blue Atlas cedar (cedrus atlantica 'glauca'). There are different forms of that species, all of which are wonderful. Thanks for the question! Бордовые и пурпурные Разнообразные сорта базилика благородного (Ocimum basilicum), вербейник пурпурный (Lysimachia purpurea), кислица рожковая (Оxalis соrniculata), перилла (Perilla), темные сорта ирезине (Iresine), амарант багряный (Amaranthus cruentus), живучка ползучая (Ajuga reptans) сортов Variegata Rubra, Atropurpurea, Burgundy Glow, Chocolate Chip. ‘Woodland Garden 1’ What is this blue narrow conifer tree? thank you PRO Jay Sifford Garden Design Hi. That is an blue Atlas cedar (cedrus atlantica 'glauca'). There are different forms of that species, all of which are wonderful. Hi, can I know what are those plants? 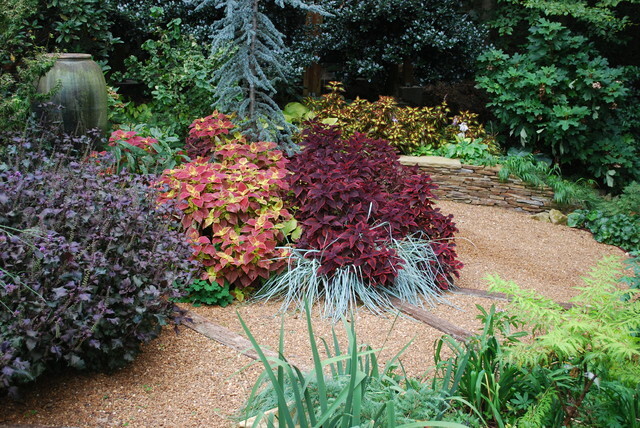 From left to right these 3 beautiful reddish and purple shrub?Thx PRO Jay Sifford Garden Design Thanks for the question. They are actually annuals, which I grow very few of here in my own garden. The left hand one is perilla, which many people are reluctant to plant because it goes to seed and literally makes thousands of plants the next spring. If you pull off the seed heads you'll do a bit better. The other two are coleus cultivars. Ландшафтный дизайн участка 30 соток - миксбордер. Ландшафтный проект лесного участка "Тихое очарование дворянской усадьбы".